The garden is increasingly seen as an extension of the house. As soon as the weather allows it people live outside as much as possible. But the English weather can still sometimes throw a spanner in the works. A outdoor fireplace or patio heater can provide a pleasant and warm terrace. This allows you to enjoy your garden and terrace more and for much longer. The outdoor season will be considerably longer with a gas fireplace. Want to buy a patio heating on gas? This is probably familiar to you: a wonderful summer day ends with a nice barbecue and preferably with drinks until late on your own terrace. But after a while, the days get shorter, and the temperatures drop. The question is then: are we going outside, or are we staying out in the cold? With a gas patio heater you will not have to make this decision. You can sit outside for hours while the gas burner gives off a pleasant warmth. And it's not just the heat of a gas patio heater that makes it nice; the flame of, for example, a Flameheater also gives the evening a unique ambience. To sum it up: with a patio heater on gas can you sit outside without having to put your jacket on! How does a gas patio heater work? The gas used for the gas heater is butane-/propane gas and is available in many places. It’s very easy to replace the gas cylinders yourself. A major advantage of gas patio heaters is that they are portable because they do not depend on electricity. Gas patio heating, such as for example Faber the Buzz , is thus perfect for a garden with several seating areas or in places where no electricity is laid out. Safety, too, is thought through: should a gas patio heater fall over, the gas flow is often automatically stopped. Would you like to enjoy your garden for as long as possible, too, even in late autumn? Then check out Firepit-online.com’s full range of patio heaters now. 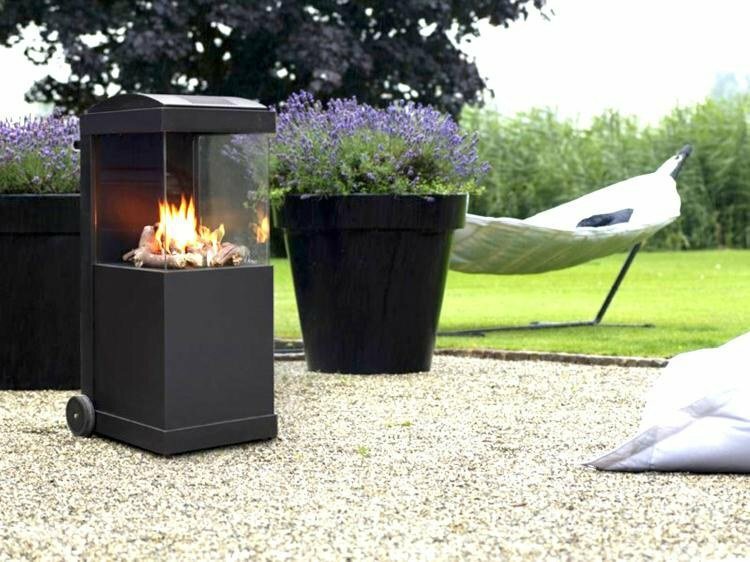 Firepit-online.com offers a wide range of patio heaters on gas. We sell the top brands Eurom, Solamagic, Outtrade and Schwank. And please don’t worry about getting the patio heater to your garden: if ordered before 17.00h, your order will be shipped the same day!